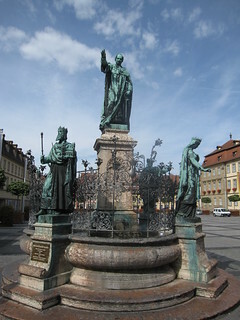 View of the Maximiliansbrunnen or Maximilian fountain on Maximiliansplatz in Bamberg, Germany. This monument was constructed in 1880, in the honor of the first king of Bavaria - Maximillian I Joseph who became king when Bavaria became an independent kingdom in 1806. It was because of his good relations with Napoleon that Maximillan was allowed to include Franconia and Swabia as part of his new Bavarian kingdom and that is why Bamberg, in Franconia, is part of Bavaria today.